Small travel trailers are the future of off grid living; it’s a bold statement, but we’re sticking to it. Whether you’re a weekend warrior who likes to get out when the weather is nice or a full time off grid adventure expert, the tiny trailer provides an excellent solution for living off the grid. 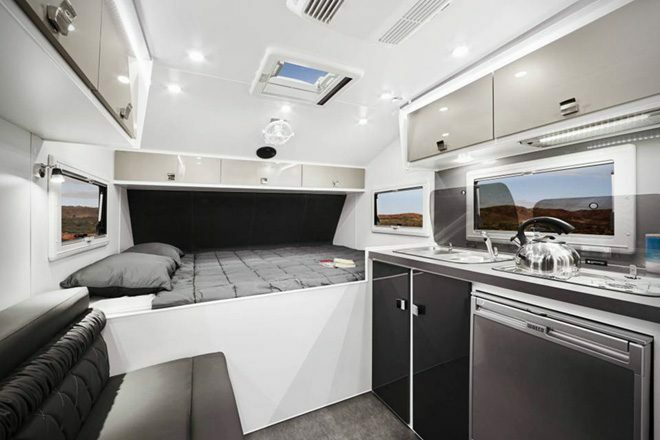 The compact camper has many faces (a little bit like Jaqen H’ghar from Game Of Thrones), with products ranging from an off grid caravan that rotates to face the sun right through to an electric trailer that helps to keep the planet spinning. The Lotus Caravan is about to join the Van Clan trailer family, and it could well be the most streamlined, clean, and functional camper trailer on the planet. Now I know what you’re thinking; caravans on Van Clan, a travesty far worse than Jeremy Clarkson being ousted from Top Gear! Rest assured, readers, these are no ordinary caravans. With names such as ‘Trooper’, ‘Freelander’, ‘Off Grid’ and ‘Tremor’, the Lotus Caravan range is as tough and ruthless as an army of unsullied and ready to take on any terrain that stands in its way. 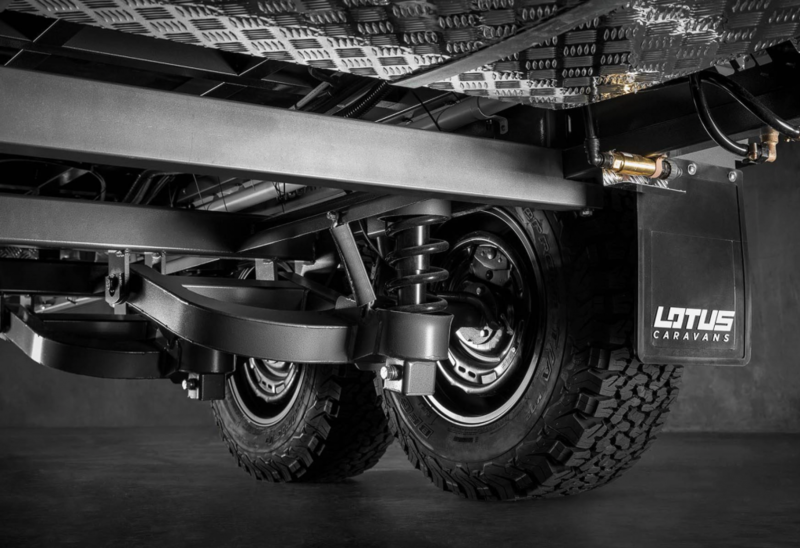 Fasten your tow-bar straps; trailer life just got a whole lot more exciting. Join our growing community of Van Lifers and Weekend Warriors over on our brand new Facebook Group! Share stories and be inspired! Behold the Lotus Caravan in all of its glory, a one-stop shop for all of your off grid living needs. 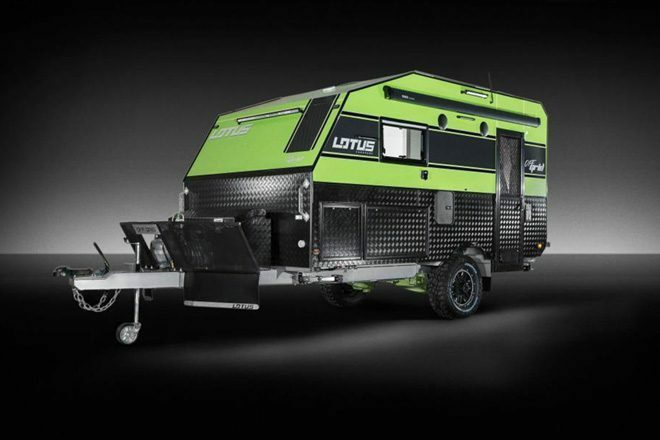 With its two-tone paint job and tough composite panels, it looks strong enough to withstand a stint on the frontline, never mind the Rocky Mountains or a tame campsite in the Algarve! At 14 feet long an with more features than you could shake a stick at, the lotus is like a swiss army knife on wheels, combining all of the necessary van life essentials into one towable tiny home. 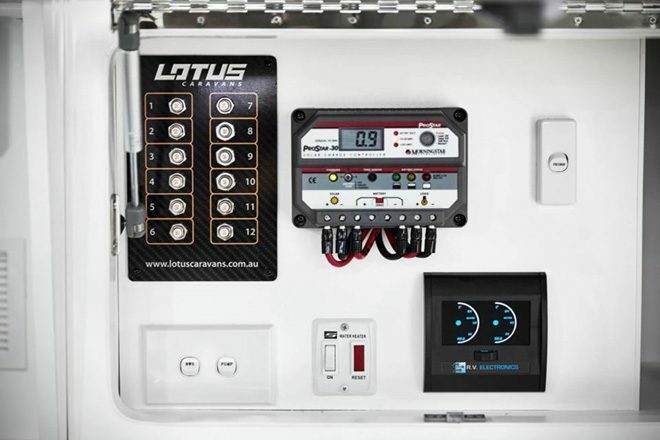 The Lotus Caravan comes equipped with dual solar panels to soak up those rays (there’s nothing better in this world than getting free energy), a state of the art battery system for charging up all of your devices on the go, and all-important water storage to keep you off the beaten path for longer. 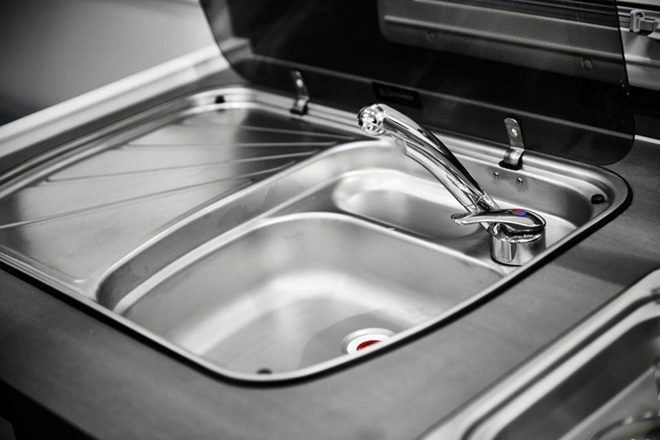 On the outside of the camper, you’ll find lots of cleverly hidden storage flaps for keeping all of your hoses, outdoor gear and other van life items tucked away. The Suspense(ion) Is Killing Me! 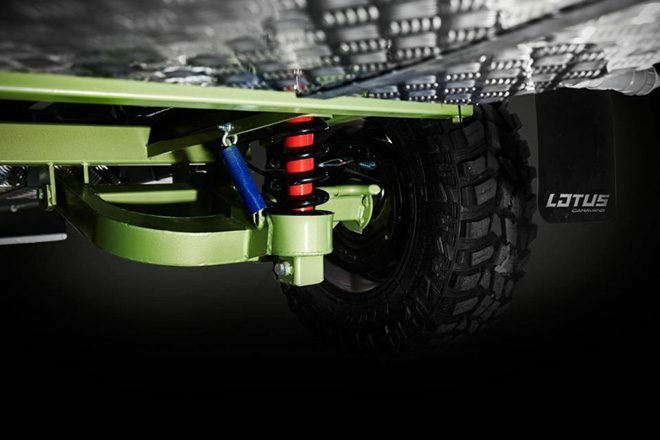 I don’t often get into the nitty-gritty technical side of trailers in my articles, but this suspension is too good to ignore (if you don’t like boring facts then you might want to skip ahead to the next section…I won’t be angry, in fact, I won’t even know that you’ve done it.) The worst thing about towing a travel trailer is when it jumps and jitters about behind your car. If you like to head down dirt lanes and unpaved roads to find the most secluded spots, then you need an off road trailer that can handle the toughest terrain. Luckily the Lotus Caravan has a suspension that knows no bounds (except the ones set out by gravity of course). This off grid trailer is built to be driven on the wild side; from the moment that you drive it off the forecourt, its will goad you into driving up mountains just to show you how tough it really is. 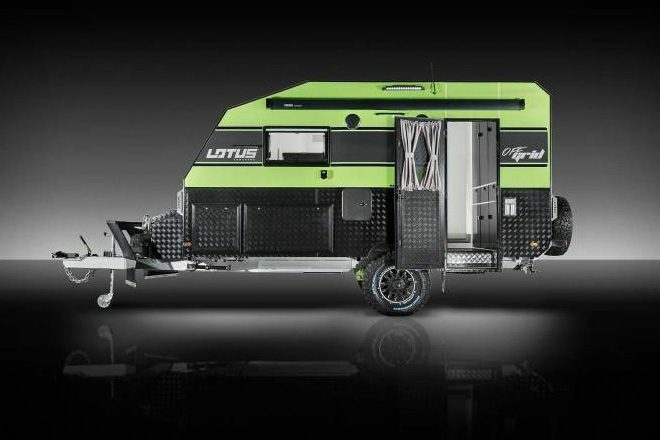 The Lotus Caravan uses customised 17″ wheels that fully compliment the extreme duty suspension, making this trailer roll over potholes like they weren’t even there. Just take a look at the pictures above and tell me that you don’t feel a little bit excited. What’s Inside The Lotus Caravan? From the minute you step in through the side door you get a feel of the sheer amount of time and skill that has gone into designing the Lotus Caravan. It’s hard to find fault with any part of this interior, except that it’s probably not an environment that I’d want to bring messy children into. Most of the furnishings are white and pretty expensive looking, and the last thing you want it to be scrubbing spaghetti hoops off the sofa when you should be out in the wild enjoying your time away. The kitchen area has a large stove, spacious sink area, a ginormous fridge for storing all of your beers, cheese, meat, veg and anything else that you might want to keep chilled for the duration of your van life travel adventure (check out these vanlife recipes if you’re looking for some great meals to cook in a tiny space!). 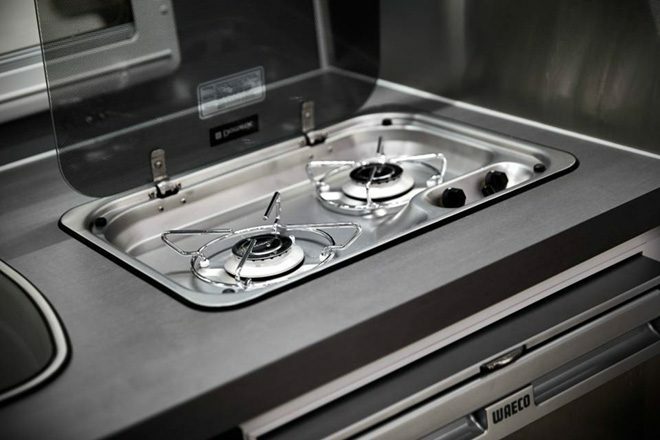 The Lotus Caravan boasts tonnes of storage on the inside of the camper too, with overhead cupboards in the kitchen and bedroom areas for all of your dried goods, tins, top cooking accessories, clothes, bedding, blankets and more. 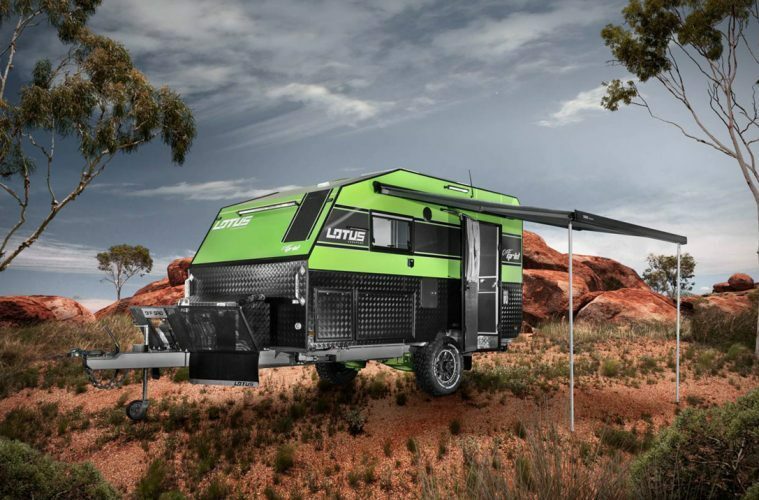 It looks like lotus took a few tips from our ‘staying organised while living off grid‘ article! The Lotus Caravan makes use of natural light by implementing large windows into its build, as well as a roof vent that you can also open to draw fresh air in on hot days. Pull down blackout blinds keep the sun out if you want to have a sleep in, and bright led bulbs can always be switched on if you don’t want pesky neighbours looking in at you while you eat your breakfast in your pants. A roof fan also provides warm or cold air depending on your environment, making the Lotus Caravan one of the affordable tiny homes that you can use all year round! What Kind Of Tech Does The Lotus Caravan Have Hidden Away? A state of the art off road camper trailer needs to have a serious tech section inside (it stands to reason! ), and the Lotus Caravan doesn’t disappoint. On the roof of your monster camper you’ll find two 170 watts solar panels that you can use to harness the power of the gods (as long as the only god you worship is the sun), along with two 120Ah batteries that will give you more than enough power to charge up your devices on the go. There’s no need for a portable solar charger in this caravan, but you could definitely consider some of our best power banks if you like spending a lot of time away from base camp while travelling around the wilderness. If you’re running a little low on juice, or perhaps you’ve escaped the heat of the sun by parking on a shaded campsite, then a 25AH battery charger can be used to top up your batteries while stationary. A solar charge regulator keeps everything working like clockwork behind the scenes, and a nifty looking touch button fuse-board takes away the need for multiple isolator switches and complicated cable runs, providing a safe way of cutting power to your devices in an emergency. Gone are the days where we think of a caravan being a beige, flowery-cushioned monstrosity that our parents used to take us to the seaside in. The Lotus Caravan is an off grid machine, and a perfect vehicle to take with you on a long adventure into the wild. It’s comfortable, it’s stylish, and it’s as rugged as The Mountain (if you haven’t guessed already I’ve recently been re-watching every episode of Game Of Thrones). The lotus is made to withstand anything that nature throws at it and is the perfect choice for anyone who loves finding those hard to reach park-ups where wannabe campers are too scared to dwell. Now, all we need to do is find out how much the Lotus Caravan costs. Each caravan can be completely customised, allowing you to choose everything from the colour of the decals to the size of the floorplan. I’ve just had a go at making my own Off Grid Lotus Caravan, adding a diesel heater, bike rack, and fridge upgrade to the package. Unfortunately, you have to contact a dealer to find the end price, which either means that they can’t give individual prices because each caravan is different, or because they are all wildly expensive. We don’t want to shatter your dreams by finding out the price, so if you’re brave enough to find out on your own, then we wish you good luck. Remember, you can always cheer or complain about your findings on our social media networks! Join us on Facebook, Twitter and Instagram and keep in touch! Rent an RV with Outdoorsy and get a taste for living the van life! Van life influencers share their favourite products and features!